Fancy 0% Credit or Debit Card Fees? What could possibly be better than our lowest-in-class fees? No fees at all! Sound too good to be true? It’s not—and the SmartTrade app makes it easy. We already charge less than PayPal Here, Square, iZettle, and payleven. But if you want even lower fees, you can easily get 0% on all of your transactions. How? By passing on the card transaction fee to your customer. Option 1: Choose 100% if you want the full card fee to be paid in full by the customer at 100%, so you will be paying 0% + 0p. Option 2: Choose 50%, if you want to split the card fee with the customer so they pay half and you pay half. The rate is 1.32% + 10p each. Its a good idea to offer splitting the card fee with the customer if the card payment is high, say over £1,000. Option 3: If you choose ‘Don’t pass through’ then you are paying the card fee, which is the standard Card Fee is 2.65% + 20p transaction fee. 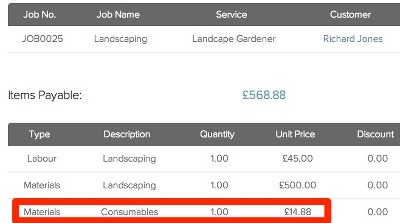 The customer will get the Card Fee added to each invoice as a ‘Consumables’ charge to the invoice. See how easy it is to get 0% Card transaction fee! Not using SmartTrade yet? Download the free iPhone / iPad app or Android App today and give it a try!